Kleine Haustiere erlaubt – JA, auf Anfrage und gegen Aufpreis von € 35 pro Tag. Nur möglich in gewissen Zimmertypen wie die Parksicht Zimmer mit Ausgang zum Garten. 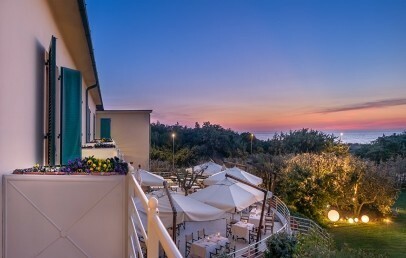 Gleich hinter dem Strand von Marina di Castagneto Carducci, in der Provinz Livorno, steht das Tombolo Talasso Resort, umrahmt von einem uralten Park mit Pinien. Der Strand liegt wenige Meter vom Resort entfernt und ist charakterisiert von den „tomboli“, den für diese Zone typischen Sanddünen. Wenige Schritte von hier befindet sich das Mittelalterliche Dorf Castagnato Carducci. Das Hotel ist eine raffinierte Anlage, welche der Restauration eines Landgutes aus den Dreißigerjahren entsprang, bei der die ursprüngliche Architektur vollkommen erhalten blieb. Das elegante und schlichte Ambiente widerspiegelt die Philosophie des Tombolo Talasso Resorts, welches, in einer geschickten Verbindung aus Vergangenheit und Zeitgeist, den Blick in die Zukunft richtet, ohne dabei die Werte des Vergangenen zu unterschätzen. Die 117 Classic und Superior Zimmer, Junior Suiten und Suiten unterscheiden sich alle voneinander und liegen verteilt über die 4 Flügel des Gebäudes. 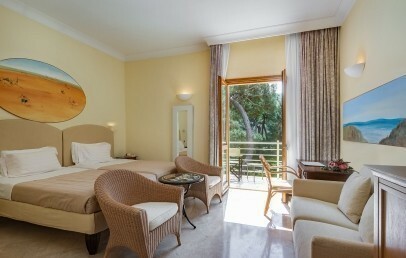 Mit Blick auf das Meer, seitlicher Meerblick oder auf den Park, sind sie mit originellen Möbeln eingerichtet, in warmen Pastellfarben gehalten und bis ins Detail durchdacht um die Gäste des Tombolo Talasso Resorts zu verwöhnen und willkommen zu heissen. Selbstverständlich sind die Zimmer mit modernem Komfort ausgestattet, zu dem unter anderem ein Fernseher mit Satellitenempfang und die individuell regulierbare Klimaanlage gehören. Das Wellnesscenter ist zweifelsohne die Stärke des Tombolo Talasso Resorts. Das Thalassotherapie-Zentrum offeriert verschiedene Typologien personifizierter Behandlungen, die Kenntnisse der orientalischen Methoden mit der heutigen Technik vereinend. Das Zentrum ist ein Spa und bietet eine Serie Gesundheitskuren an, für die purstes Wasser, 900 m von der Küste entfernt abgefüllt, verwendet wird: Massagen, Hydromassagen, Duschen und Schönheitsbehandlungen. Kinder ab 3 Jahren haben Zugang von 9 bis 11 Uhr, dies nur in Begleitung eines Erwachsenen. Die Küche des Restaurants “Corallo” kocht nach traditionell toskanischen und internationalen Rezepten, für die der Chefkoch frischeste und qualitativ tadellose Zutaten sorgfältig zusammenstellt. Um zu den vorzüglichen Köstlichkeiten ein Glas Wein zu genießen, wählt man aus einer Weinkarte mit stolzen 300 verschiedenen Flaschen. Das Mittagsbuffet wird in den heißen Monaten auf der Panoramaterrasse serviert. Der 200m lange, mit Liegestühlen, Sonnenschirmen und Teakstühlen ausgerüsteten Privatstrand liegt direkt vor dem Resort. Wer auf der Suche nach Ruhe ist, kann sich draussen in den Meerwasserpools entspannen, von denen einer für Erwachsene und einer für Kinder reserviert ist. Verschiedene Aktivitäten locken im nahen Umfeld des Tombolo Talasso Resorts: der „Aquapark“, der „Parco dei Tarocchi“ und die „Magiré, die wunderbare Welt des Cavallino Matto“, welches mit seinen Unterhaltungen und Attraktionen Kinder aus der ganzen Toskana anzieht. Kostenloser Yogastunden sind von Mitte Mai bis Mitte September möglich; medical Wellness für das Wohlbefinden von Frauen und ästhetische Medizin. Kurtaxe – Die Gemeinde verlangt die Zahlung einer Kurtaxe, die vor Ort zu bezahlen ist. Classic rooms are all different from each other and are distributed along the 4 wings of the building. They feature original decor with pastel and beige colors and characterized by natural materials like wood, leather and cotton. The en-suite bathroom, tiled in mosaic, marble or hand painted, is equipped with bathtub and/or shower, bathrobe, slippers, hairdryer and complimentary toiletries. The Classic rooms have a window or a little garden with park side view (balcony is available on request and for extra charge). Classic connecting rooms possible on request. Superior rooms are all different from each other and are distributed along the 4 wings of the building. They feature original decor with pastel and beige colors and characterized by natural materials like wood, leather and cotton. The en-suite bathroom, tiled in mosaic, marble or hand painted, is equipped with bathtub and/or shower, bathrobe, slippers, hairdryer and complimentary toiletries. The Superior rooms have a window or a little garden with park side view (balcony is available on request and for extra charge). 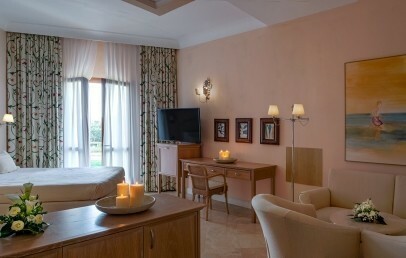 Classic or Superior connecting rooms are possible on request. Junior Suites are all different from each other, feature original decor with pastel and beige colors and characterized by natural materials like wood, leather and cotton. 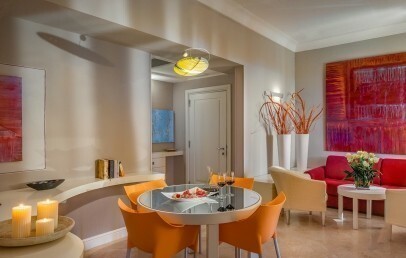 They consists of double room and separated living room with sofa bed or pull-out chair. The en-suite bathroom, tiled in mosaic, marble or hand painted, is equipped with bathtub or shower, bathrobe, slippers, hairdryer and complimentary toiletries. 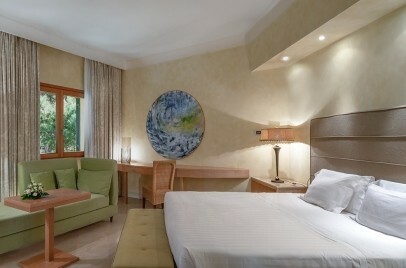 The Junior Suites have a window with park side view (balcony is available on request and for extra charge). 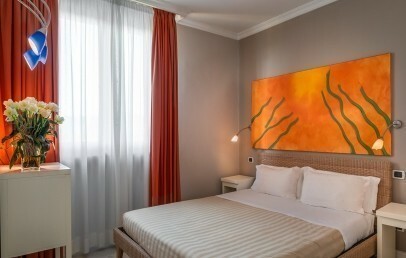 All Suites, named after Livorno painters, are all different from each other, feature original decor with pastel and beige colors and characterized by natural materials like wood, leather and cotton. 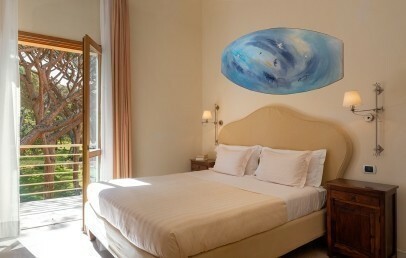 They consists of two bed room (double bed and queen-size bed) and separated living room. They have an en-suite bathroom, tiled in mosaic, marble or hand painted, is equipped with bathtub, bathrobe, slippers, hairdryer and complimentary toiletries; and a toilet. The Suites have a covered terrace with park side view. All Suites, named after Livorno painters, are all different from each other, feature original decor with pastel and beige colors and characterized by natural materials like wood, leather and cotton. 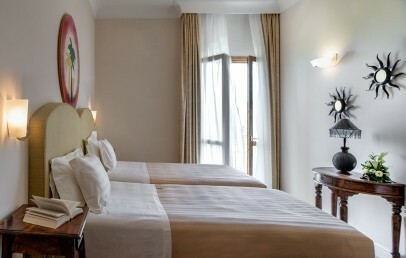 They consists of two bed room (double bed and queen-size bed) and separated living room. They have an en-suite bathroom, tiled in mosaic, marble or hand painted, is equipped with bathtub, bathrobe, slippers, hairdryer and complimentary toiletries; and a toilet. 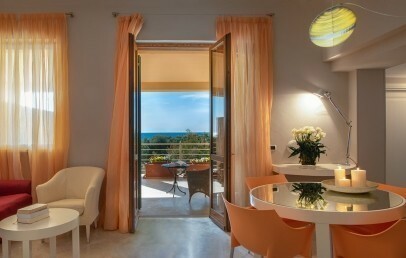 The Suites have a covered terrace with sea side view. Classic rooms are all different from each other and are distributed along the 4 wings of the building. They feature original decor with pastel and beige colors and characterized by natural materials like wood, leather and cotton. The en-suite bathroom, tiled in mosaic, marble or hand painted, is equipped with bathtub and/or shower, bathrobe, slippers, hairdryer and complimentary toiletries. The Classic rooms have a window or a little garden with sea side view (balcony is available on request and for extra charge). Classic connecting rooms are possible on request. Superior rooms are all different from each other and are distributed along the 4 wings of the building. They feature original decor with pastel and beige colors and characterized by natural materials like wood, leather and cotton. The en-suite bathroom, tiled in mosaic, marble or hand painted, is equipped with bathtub, bathrobe, slippers, hairdryer and complimentary toiletries. The Superior rooms have a window or a little garden with sea side view (balcony is available on request and for extra charge). 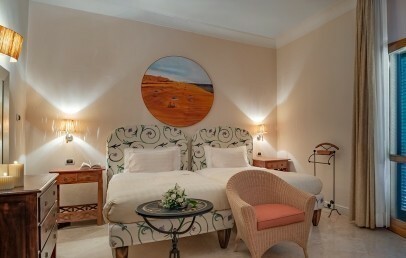 Classic or Superior connecting rooms are possible on request. Junior Suites are all different from each other, feature original decor with pastel and beige colors and characterized by natural materials like wood, leather and cotton. 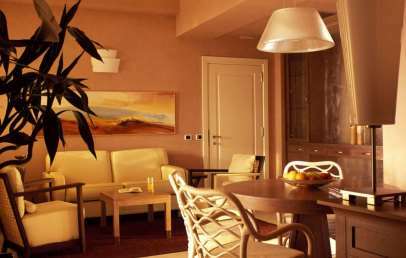 They consists of double room and and separated living room with sofa bed or pull-out chair. The en-suite bathroom, tiled in mosaic, marble or hand painted, is equipped with shower, bathrobe, slippers, hairdryer and complimentary toiletries. 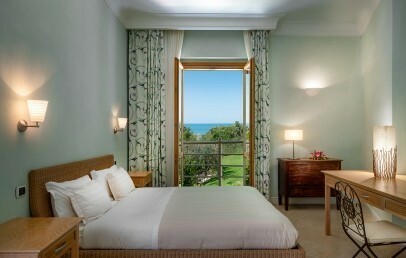 The Junior Suites have a window with sea side view (balcony is available on request and for extra charge). 2-stündige Thalasso Parcours pro Person, pro Tag im Preis inbegriffen (gegen Reservierung im Wellness-Zentrum)! Mahlzeiten für das Kind (0 - 3 Jahre alt) vor Ort à la carte zu bezahlen.